These are interesting questions to ask people. 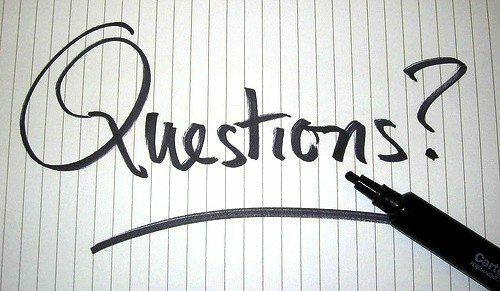 They are not just random questions but questions that are friendly and will make people feel good. Most people don’t actually know how to ask questions and when they do, they end up sending the wrong signals with their question unknowingly. Especially when you are meeting with someone for the first and you are trying to make a good impression, your question can turn the person off. Remember not to ask too much or too little questions particularly when you are meeting them for the first time. Yes, you know the first impression is lasting and also, it does not take second chance to make a first impression. So if you don’t want to ruin that first impression, these are some interesting questions to ask people around you without embarrassing them. 1) What was the last picture you took with your phone? 2) Do you know any big gossips? 3) Have you been pulled over by a cop? 4) Do you know your heritage? 5) What have you always wanted? Did you ever get it? 6) What kind of sickness have you lied about so you wouldn’t go to work? 7) What was the last lie you told? 8) Have you ever danced in the rain? 9) What is your blood type? 10) Have you ever been in a car accident? 11) What was the weirdest prank call that you have made? 12) Best compliment you have received? 13) Do you trust anyone with your life? 14) What is your greatest strength or weakness? 15) What is your perfect pizza? 17) Do you get along with your family? Why or why not? 18) Ugly and live forever, or look attractive and die in a year? 19) You discover that your wonderful one-year-old child is not yours because of a mix up at the hospital, would you want to exchange the child to correct the mistake? 20) Would you be willing to lie to a court for a close friend if it meant saving your friend from going to jail for life? 21) Would you be willing to eat a bowl of crickets for $40,000? 22) If you could have anyone locked in a room so that you could torment them for a day, who would you choose and how would you torment them? 23) Do you feel that children should be sheltered from unhappiness? 24) If you could have personally witnessed anything, what would you want to have seen? 25) If you could wake up tomorrow in the body of someone else, who would you pick and what would you do? 26) If you could be any age for a week, what age would that be? 27) What question do you hate to answer? 28) If you could only have one meal for the rest of your life, what would it be? 29) Where do you go to get on a computer? 30) How do you start a conversation? 31) What keys on a keyboard do you not use? 32) If you had a brainwashing machine, who would you use it on? 33) You are walking home in the dark and you see something move, What/Who is it (guess)? What do you do? 34) What is the strangest name someone has introduced themselves as to you? What is their real name? 35) Where were you 3 hours ago? Do you think someone was stalking you? 36) Have you ever eaten a crayon or glue? What strange thing have you eaten? 38) What cheers you up? 39) What do you constantly think about that, either makes you sad or just anything? 40) Is there something you constantly lose at your house or anywhere? 41) Do you have a favourite book or read much? Why or why not? 42) What is the longest you have gone without sleep? 43) Do you have anyone you go to for advice? In person or online? 44) What is the habit you are proudest of breaking or want to break? 45) Is there anything I should know? 46) What do you order or not order at a restaurant you have been to or never been to? 47) What is your favourite word? Least favourite? 48) Describe something that’s happened to you for which you had no explanation. 49) What did you do for your latest birthday? 50) What holidays do you celebrate? Are you a religious person or not? 51) If you had to be named after a city, state, or country (etc), which would you want it to be? 52) Who is your hero? 53) Which do you use more often, the dictionary or the thesaurus? 54) Have you ever been stung by a bee? 55) Have you ever tipped a cow? 56) What’s the sickest you have ever been? 57) Are you still learning who you are? 58) Are you afraid of heights? Or what are you afraid of? 59) Have you ever taken dance lessons? Who would you want to dance with? 60) What is the most memorable class you have ever taken? 62) What’s your favourite knock-knock joke? 63) What is your favourite commercial? 64) If you could spend the day with any celebrity, who would it be? 65) What is your favourite breakfast food? 66) Do you like guacamole? Have you ever been in a food fight? 67) What is your favourite thing to spend money on? 68) What is the weirdest thing about you? Are you proud of it? 69) Ever been in love with 2 people at the same time? Do you think that’s wrong? 70) Ever had any relatives in jail? 71) Glass half full or half empty? Or is the glass just malformed? 72) Mountains or the beach? View, or the TV? 73) Airplane, train, or car? Boat, subway, or teleportation device? 74) If you could retire tomorrow, what would you do? 75) Ever sold/donated your blood? If you haven’t do you want to? 76) Crowds, small groups, or “Go away, I’m a loner”? 77) Describe the most terrifying moment of your life so far. Have you recovered from it? 78) What famous person do people tell you that you most resemble? 79) What is the strangest thing you have ever eaten? 80) If you could bring any person back to life, who would it be? 81) Do you believe honesty is the best policy? 82) What dead person would you least want to be haunted by? 83) Who would you most like to be stuck in an elevator with? 84) Who is the last person you would like to be? 85) What do you think Victoria’s Secret is? 86) Which cartoon character do you resemble the most? 87) Would you rather go a week without bathing, but be able to change your clothes? Or a week without changing your clothes but be able to bathe. 88) Which of the four seasons do you most love? Or hate? 89) If you could choose your method of dying and where, what would they be? 90) If you had to be trapped in a TV show for a month, which would you choose? 91) List someone you know, and describe them in 5 words. 92) You can select one person from history and have them truthfully answer one question, who would you select and what is the question? 93) If you join the circus, what would you perform? 94) Is there anything purple within 10 feet of you? What is it? 95) When was the last time you bought something? What was it? 96) Are you wearing socks right now? 97) Have you been to the movies in the last 5 days? 98) When was the last time you ran/went for a jog? 99) Your dream vacation? Worst vacation? Best vacation? 100) Worst injury you have had?